Why Testmasters ACT Prep Courses? Testmasters knows how the test writers think. We know how our students think, and how to help them defeat the test. Testmasters experts analyze every question on every available exam. Testmasters has more than 20 years of course analysis and test strategies to share with you. Testmasters has helped thousands of students get into their dream universities. We understand that students need a stimulating environment and a charismatic teacher to motivate them, and we bring them a dynamic and entertaining experience in our ACT preparation course. Teachers at Testmasters are experienced, engaging, and extensively trained in the art of ACT preparation. Unlike our competitors, who hire one teacher with shallow knowledge in many subject areas, our course is taught by four or five topic specialists to pinpoint and eradicate your weaknesses. The quality of courses at Testmasters affords us the ability to offer a minimum 4-point score increase guarantee after taking our course. We base our course materials on real exams, including unique strategies and tips to help you excel on test day. Our course manuals undergo a rigorous development process with multiple revisions to ensure Testmasters students receive a top-notch product. With hundreds of pages of sample questions and detailed explanations, our custom-designed manual forms the foundation for the Testmasters ACT course. How Do I Register For A Testmasters ACT Prep Course? 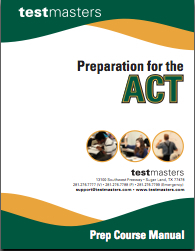 Students can register for a Testmasters ACT Course online or by calling (281) 276-7777. For private ACT preparation courses, call Testmasters at (281) 276-7777.